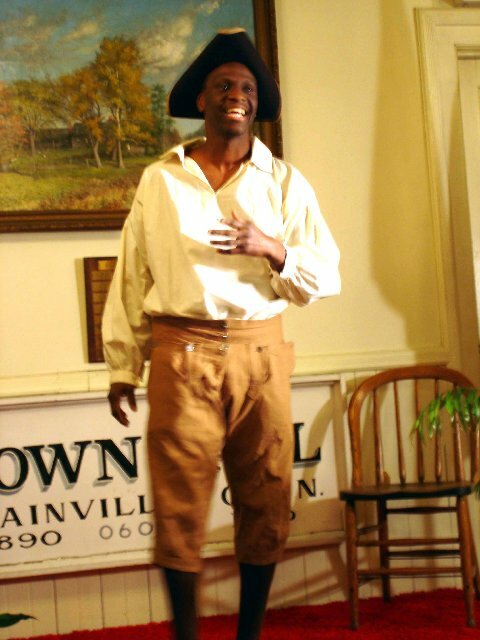 Next meeting: Oct. 27 “Jordan Freeman: The Fight to Set a People Free” | Southington Genealogical Society Inc.
On Tuesday, October 27th at 7:30 pm, the Southington Genealogical Society will present Kevin Johnson as Jordan Freeman, an African-American servant of John Ledyard and the body servant of Col. William Ledyard in the Revolutionary War. Jordan Freeman was an actual person, a native of Old Lyme. Although he did not enlist himself, he witnessed key events of the war for independence while with Col. Ledyard. Historians estimate the number of black soldiers in this war to have been about 5,000 men, serving in militias, seagoing services, and support activities, including nearly 500 from Connecticut. Some enlisted because they felt it was their duty; others because they were offered their freedom in return for satisfactory completion of a set period of service. The presentation is based on extensive research in the collections of the Connecticut State Library and the Museum of Connecticut History at 231 Capitol Ave, opposite the State Capitol in Hartford. Kevin Johnson is an employee of the State Library’s History and Genealogy Unit. In addition to portraying Jordan Freeman, he has been presenting as Pvt. William Webb, a soldier in the Civil War, for more than 16 years and has given more than 500 presentations. The Connecticut State Library provides high quality library and information services to state government and the citizens of Connecticut. It also preserves and makes accessible the records of Connecticut’s history and heritage. The focus of the Museum and its collections is Connecticut’s government, military and industrial history. Permanent and changing exhibits trace the growth of the State and its role in the development of the nation from the Colonial era to the present. Additional information about the State Library and the Museum of Connecticut History can be found on its Web page at http://www.ctstatelibrary.org. For more information, please contact Kevin Johnson, (860) 757-6589 or Carolyn Picciano, (860) 757-6580. There is no admission charge and no obligation to become a member. No reservations are necessary. The facility is handicapped accessible with an elevator. The Southington Genealogical Society is a non-profit organization located in central Connecticut that promotes the accurate recording, research and preservation of family history. The society regularly meets at 7:30 pm on the fourth Tuesday of every month, except December, at The Orchards at Southington, 34 Hobart Street, Southington, Connecticut. For more information, contact the society at southingtongenealogicalsociety@gmail.com and http://southingtongenealogicalsociety.org.